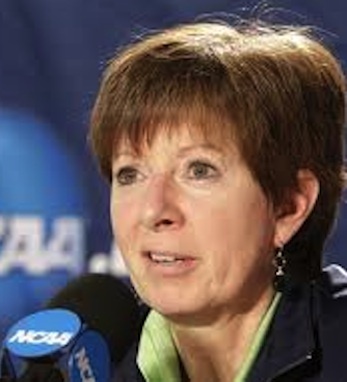 Muffet McGraw has always practiced consistency and excellence throughout her 24 seasons as the head coach of Notre Dame’s women’s basketball program. McGraw began her coaching career at Archbishop Carroll High in the Philly area in 1977, right after she married her husband, Matt. In 1980, McGraw moved on to college coaching as an assistant at Saint Joseph’s in 1980, a team that she had also played for in her own college years. She then became head coach at Lehigh in 1982 before taking over at Notre Dame in May of 1987. This season, McGraw took her team all the way to the 2011 Women’s NCAA championship. It was a close, back-and-forth game, but the Irish lost to Texas AM with a score of 76-70. Although defeated this year, the Notre Dame won the championship against Purdue in 2001, making McGraw one of only eight active Division I coaches to guide her team to a national title. She also ranks among the top 20 NCAA Division I coaches, with over 613 wins and is one of only five coaches in the 124-year history of Fighting Irish athletics to win 500 games at Notre Dame. McGraw has earned several awards and honors throughout her career including national coach-of-the-year honors from the WBCA, Sports Illustrated for Women and Associated Press, as well as the Atlanta Tipoff Club, which named her the Naismith Women’s College Coach of the Year.